23 year old Steven Caulker hails from Feltham, London. He started playing with local side Hounslow Borough while in his teens. Young Steven must have showed promise, as he was offered trials with no fewer than seven different clubs and in 2007 he chose to sign for Spurs at the age of 15, while rejecting offers from QPR, Reading and Chelsea. Steven went on to sign his first professional contract in July 2009. Later that summer, he joined Yeovil Town on a short term loan, making 44 first team appearances for the First Division side. During this period he was called up to the England U19's set up. Caulker returned to Spurs for the start of the following 2009/10 season and made his first appearance for them in a 4-1 League Cup defeat to Arsenal in September 2010. Just five days later Steven was sent to Championship side Bristol City on loan until the end of the season. He made 30 appearances in all competitions, scoring his first senior goal in a 3-2 defeat at Cardiff City. Caulker also made his England Under-21s debut at this time, coming on as a substitute in a 2-0 defeat in Germany. His stay with Bristol City was cut short due to injury, but he was still named as the club’s young player of the year. Caulker moved up to the Premier League in 2011, with a loan spell at Swansea City. He made 26 appearances for the Swans, helping the club to 11th place in the Premier League during their first season back in the top flight. At the end of that season, Caulker was included in Stuart Pearce’s 18-man Great Britain squad for the 2012 London Olympics. He featured in every one of Team GB's games, as they ultimately were defeated in the quarter-finals by South Korea. The 2012/13 season saw Caulker make his long awaited breakthrough into the Spurs side, playing 18 times in the Premier League, scoring twice and making six appearances in the Europa League. Caulker also won his first England senior cap in November 2012, scoring a goal in a 4-2 defeat against Sweden. In spite of the success with Spurs, he was sold to Cardiff in the summer of 2013, for a fee thought to be in excess of £8 million on a four year contract. He played in every Premier League game for Cardiff that season, scoring five times, but the Welsh side were relegated to the Championship at the season's end. Having tasted football in the Premier League, he moved to QPR during the summer of 2014 on a four year contract. He made 36 appearances for Rangers, scoring a single goal, but once again was relegated. 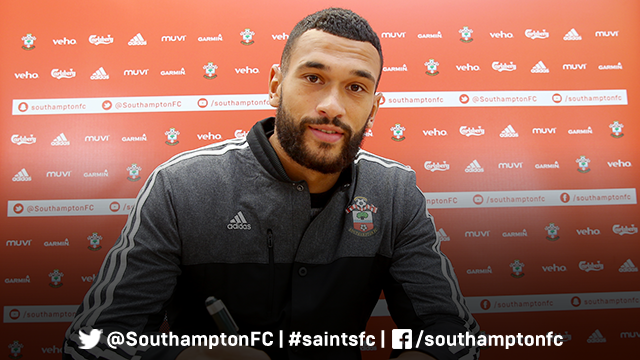 Caulker joined Saints on a season's long loan, which was cut short in January, having only played six games. He was subsequently loaned by QPR to Liverpool for the remainder of the season. This may have been linked with the January deal for Saints to buy Charlie Austin from QPR. In what was ultimately a party atmosphere, Saints qualified for the Europa League by finishing in 5th place, equal on points with Manchester United, but ahead on goal difference. That could change, with the Manchester United v AFC Bournemouth game abandoned. If ManU win, or draw the rearranged game, then Saints will finish 6th, which is still a Europa League qualifying place. Heck of a way to end the season. Saints won the Qualifying Round 3 against Vitesse 5-0 on aggregate. In the Play Off Round Saints faced Danish Champions, Midtjylland. The first leg was played on Thursday 20th August at St.Mary’s, ending in a 1-1 draw. The decisive return match was on Thursday 27th August in Denmark, which ended in a poor 1-0 loss and ultimate exit from the competition. Saints drew MKDons away on Wednesday 23rd September, which ended in a straightforward 6-0 win. Well, that was short and not very sweet. Saints faced Crystal Palace in the 3rd round of the 2015/16 FACup, but lost 1-2 on the day. Saints signed nine players this season. Two on loan and seven on long term contracts. Read more about them by clicking the button. Kelvin is retiring after being central to the club's rise through the divisions. Saints awarded him that rare thing these days, a testimonial which enabled him to have a great evening with current and past colleagues, while raising a lot of money for charity.